For 2017, Suzuki introduces a new version of an iconic motorcycle that embodies the sporty personality that only a lively, mid-sized V-twin roadster can deliver. 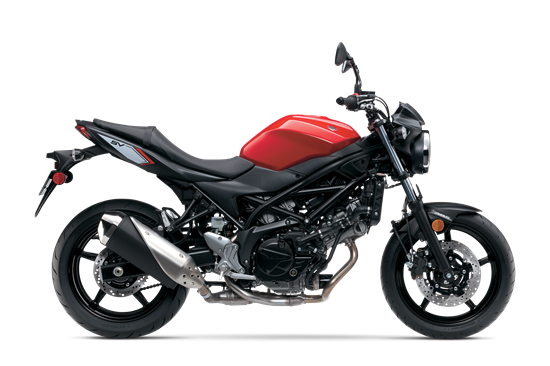 The new SV650 ABS* has a polished powerplant that provides increased performance with low emissions and outstanding fuel economy, mated to refined trim and lightweight chassis that delivers a sporty, exciting ride. In addition, the SV650 ABS has a new Low RPM Assist feature that seamlessly adjusts engine speed during take-off and low-speed running to smooth the power delivery and to help eliminate the possibility of the rider stalling the motorcycle.Like its predecessors, the 2017 SV650 promises to have the sparkling performance, style and value that a broad range of riders will enjoy. Also available without ABS.